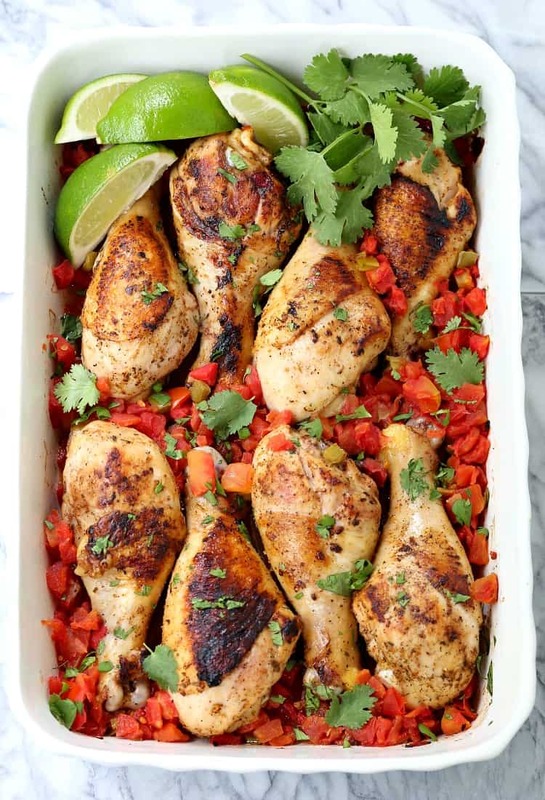 These Oven Baked Fiesta Chicken Legs are one of our new favorite dinners! So easy, just throw everything into a baking dish and get it in the oven, dinner will be a party in no time! 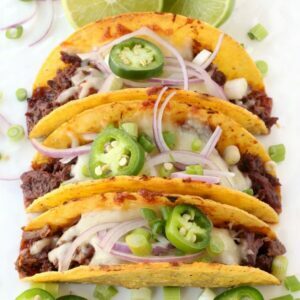 Because dinner should at least taste like a party every night, right? Let’s face it, dinner time is usually pretty hectic around our house. So as much as I’d like to sit back and have a couple beers with a big plate of nachos…that doesn’t happen. One kid is going in one direction and the other kid is going in a different direction. I can’t even imagine what it’s like for people that have more than two kids – one for each parent seems like all we can handle! So after you’ve had pizza for the hundredth time and really don’t feel like microwaving anymore dino nuggets…it’s time to get some food on the table. 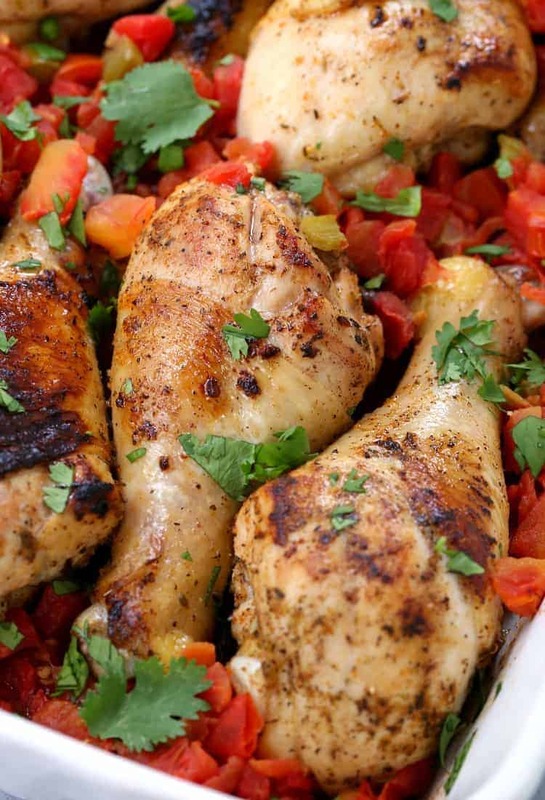 That’s when we turn to easy dinners like these Oven Baked Fiesta Chicken Legs. Everything goes into the baking dish and into the oven. There’s nothing more to think about except what you’re making on the side like maybe these Stick of Butter Smashed Potatoes. And sometimes we feel so impressed with ourselves just getting dinner on the table and sides just don’t happen. And that is ok by me. A couple of these drumsticks is way better than dino nuggets any day. 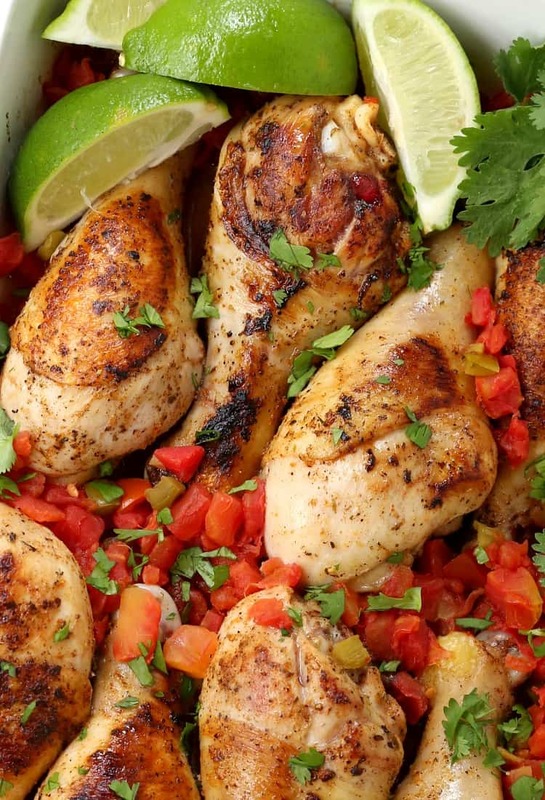 The only thing you have to do for these Oven Baked Fiesta Chicken Legs is plan on the marinating time. The marinade is what really flavors this chicken so don’t cut it short. 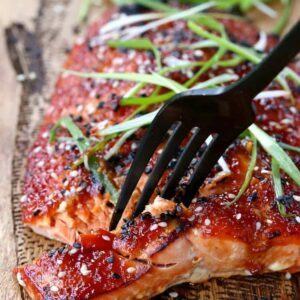 At least for hours but the longer you let them sit in the fridge, the better the flavor will be. 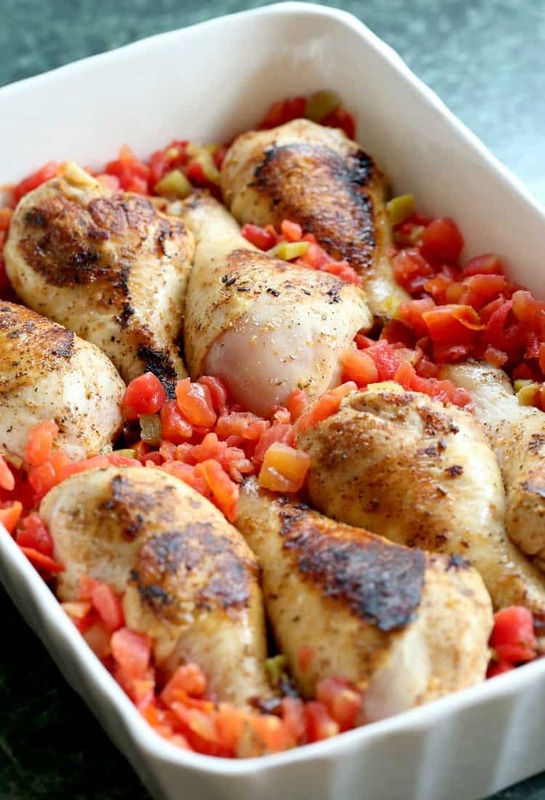 Wipe the marinade off the chicken with paper towels and get them in a large skillet to brown. Get them nice and crispy then place them in a baking dish with Ro-Tel. Cover and bake for 30-40 minutes and dinner is done. Here’s a funny thing I think I’ve talked about before but maybe for new visitors you haven’t heard this story. I don’t like chicken on the bone. Right? Who’s with me!!! I know there’s more crickets out there right now than not, but I do know there are more people like me out there. I’ve met them. They exist. I don’t know what it is, because I can kill a few pounds of chicken wings no problem. But a chicken thigh or a drumstick like this? No thanks. 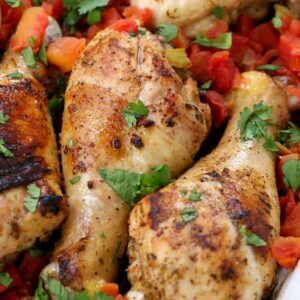 But dinners like these Oven Baked Fiesta Chicken Legs or these Upside Down Pineapple Chicken Thighs have totally changed my feelings about chicken in the bone. I like it. I really do. So maybe I just wasn’t easting the right types of chicken on the bone, maybe I just needed to make chicken on the bone the way I wanted to eat it…who knows. Point is – taste buds can change. In a seriously tasty way! Add all the oil, garlic, lime juice, salt, pepper, paprika, oregano, cumin and taco seasoning into a bowl and whisk together. Add the chicken thighs to a resealable plastic bag and pour the marinade in. Shake the bag around to cover all the drumsticks then place in the refrigerator for up to 8 hours. Spray a skillet with cooking spray and heat over medium high heat. 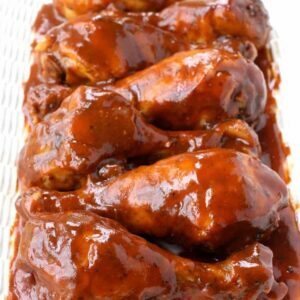 Remove the drumsticks from the marinade and wipe off each drumstick with a paper towel removing most of the marinade. Brown in the skillet for 5 minutes per side until browned then remove to a baking dish. Add the drained Ro-tel to the baking dish, cover and bake for 40 minutes. Garnish with fresh lime juice and cilantro if desired and serve.